I love products from Innisfree. Their face & foot masks, hand cream, Green Tea Serum a few favourites. So when I spotted the Innisfree Camellia Essential Hair Conditioner in their store, I pounced. I’ve been using it for some time now since my Bodyshop Rainforest Moisture Conditioner finished. Find out if I liked the new conditioner more below! It’s thicker than the Bodyshop Rainforest moisture. Detangling my curls was SO much easier because the slip is great! Getting a conditioner without silicones isn’t easy, let alone in a offline store! Despite the creaminess, it does not buildup on my hair. It does have Isopropyl alcohol which is a drying alcohol but it at the end of the ingredient list (which denotes that is extremely less). The Camellia Essential Hair Conditioner has a subtle, sweet scent. Fragrance is very important to me. Especially since a medicated shampoo I use sometimes has a wet-dog smell and i need my hair smelling fantastic. It is currently monsoons & hair gets frizzy easily. The glycerine helps maintain moisture balance and reduce frizz. There’s CETYL & STEARYL ALCOHOL which are moisturising alcohols. Oils like Jojoba & Argan are great for slip and shine! It’s pricey for just 200 ml. The Innisfree Camellia Essential Hair Conditioner will last me almost a month at most as compared to the Bodyshop one that will last me 2 months & more easily. This won’t be great for hot, dry places or seasons. Will I Repurchase: Absolutely. Over The Bodyshop Rainforest Moisture Conditioner? Yep, yep & yep. I will, due its price, save it for my when hair is extremely tangled & needs some extra tlc. Its’s a cherry red tube with a subtle, sweet smell. You can buy it from their store (I bought one from their store in Delhi Select Citywalk, Saket) or order Innisfree Camellia Essential Hair Conditioner online on Nykaa here. Hope you enjoyed the review! If you want me to try out & share my experiences with any other product, comment below with the name! You can check out my review of three leave in conditioners/stylers for curly hair & the one I loved the best here. For more such tips & trick, subscribe to my Youtube Channel, & follow me on Instagram & Facebook to stay updated! Rawkyn Red Clay Hair Mask Review – Is it Just a Instagram Fad? 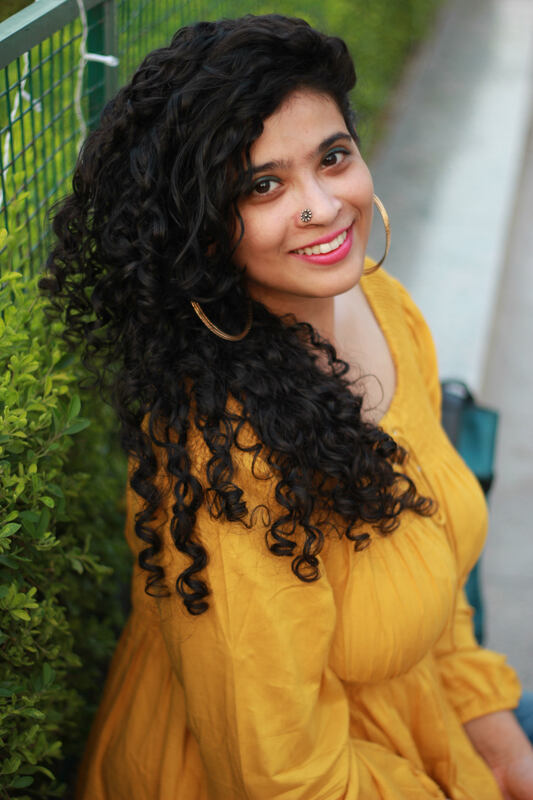 Arata Zero Chemicals Hair Cream Review- Does it Work on Curly Hair? Hey Pallavi, isn’t glycerine known to attract moisture, causing frizz. I live in Mumbai, so humidity is a huge problem! Would you recommend this conditioner then? Yes, wouldn’t recommend it in high humid places or very hot places.